What have scientists learned in five years of studying cosmic rays with the Alpha Magnetic Spectrometer experiment? 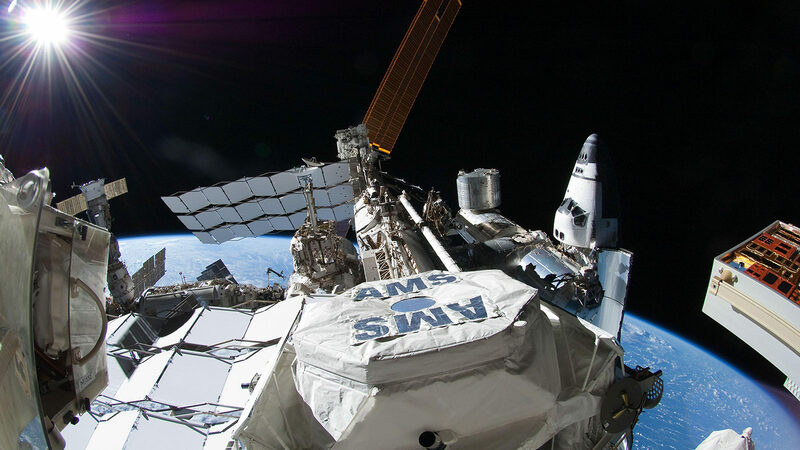 On May 19, 2011, astronauts used a remote-controlled robotic arm to attach a nearly 17,000-pound payload to the side of the International Space Station. That payload was the Alpha Magnetic Spectrometer, or AMS-02, an international experiment sponsored by the US Department of Energy and NASA. AMS was designed to detect cosmic rays, highly energetic particles and nuclei that bombard the Earth from space. Since its installation, AMS has collected data from more than 90 billion cosmic ray events, experiment lead Sam Ting reported today in a colloquium at the experiment’s headquarters, CERN European research center. Ting, a Nobel Laureate and Thomas Dudley Cabot Professor of Physics at the Massachusetts Institute of Technology, shared a mix of new and recent results during his talk. Together they spelled out the persistent message of the AMS experiment: We have a lot left to learn from cosmic rays. For one, cosmic rays could tell us about the imbalance between matter and antimatter in the universe. Because matter and antimatter particles are created in pairs, scientists think the Big Bang should have produced half of each. But those evenly matched partners would have annihilated one another, and we would not exist. The generally accepted theory is that this imbalance came about thanks to processes in the very young universe that favor matter over antimatter. But an alternative idea is that a large amount of antimatter is still out there; it just hasn’t had a chance to collide with our matter-filled universe. One clue that this is the case would be finding an antimatter nucleus in the wild. AMS scientists do not claim to have detected antihelium, but they did announce that they have not ruled out “a few” candidate events. Cosmic rays could also tell us something about dark matter, which has never been detected directly. Cosmic rays can consist of a variety of particles, such as electrons or their antimatter counterparts, positrons. 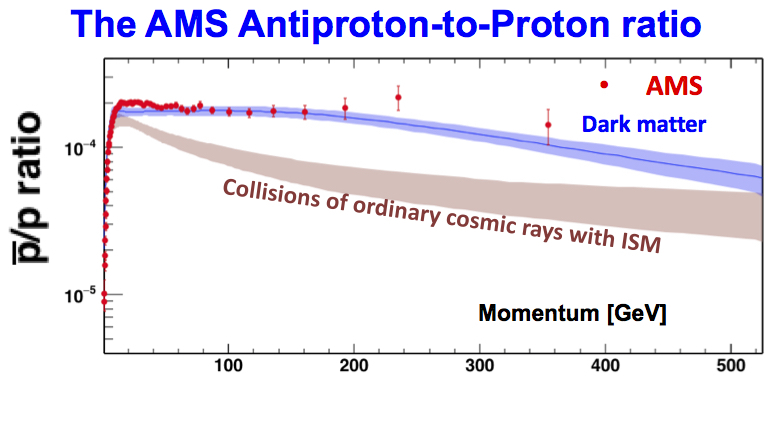 In previous measurements, AMS detected a surprising number of positrons on the higher end of its energy range. It is possible that collisions between dark matter particles created this excess of antimatter particles. An updated analysis—this one using almost double the number of electrons and positrons—continues to show this excess. But dark matter isn’t the only possible cause, Blandford says. Pulsars are a particularly difficult alternative source to rule out. But AMS scientists anticipate that they will collect enough data to better discriminate between models by 2024, Ting said in his presentation. Cosmic rays could tell us about their history. As particles in cosmic rays approach light speed, time effectively slows down for them, as Albert Einstein predicted in his theory of relativity. We can see evidence of time dilation in the extended lifetimes of particles traveling near light speed. 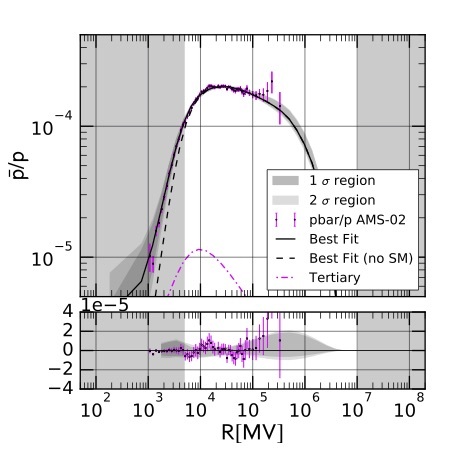 In a forthcoming AMS result, scientists look at just how much the lifetimes of isotopes of beryllium stretch as they travel in cosmic rays. Based on that measurement, they estimate the cosmic rays we see in our galaxy are about 12 million years old. Cosmic rays could tell us about what they go through on their trip to Earth. When cosmic rays get into collisions, they can produce secondary cosmic rays, which are made up of different ingredients. In a recently published result studying the ratio of boron (found only in secondary cosmic rays) to carbon (found in primary cosmic rays) at different energies, AMS scientists found possible evidence of turbulence in the cosmic rays’ path to our planet—but nothing that would explain the positron excess. Finally, cosmic rays could tell us that we don’t know what we think we know. In an unpublished analysis, AMS scientists found that their measurements of the spectra and ratios of different nuclei—protons, lithium and helium—did not fit well with predictions. This could mean that scientists’ assumptions about cosmic rays need to be reexamined. AMS scientists want to help with that. They plan to collect data from hundreds of billions of primary cosmic rays in the coming years as their experiment continues its orbit about 240 miles above the Earth.